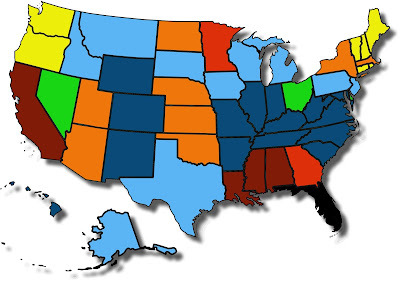 Jared Unzipped: States I Won't Reside In (And Neither Should You) - Part III. States I Won't Reside In (And Neither Should You) - Part III. Here it is, folks. This is the final part in my States I Won't Reside In (And Neither Should You) series. Here are Part I and Part II if you're catching up. I've combined my results from the previous two parts and come up with a ranking of all fifty states -- from least likely to most likely to reside in. Here's how I did it. A state marked as "no major reason not to live there" earns a +1 per map. A state marked as "would only consider living in certain specific areas" earns a +0.5 per map. A state marked as having only one specific problem as a deterrent earns a -1 per map. A state marked as having "more than one reason not to live there" earns a -2 per map. Behold, a compiled list of results! There are eight categories of point totals (-4, -3, -1.5, -0.5, 0, 1, 1.5, 2). We'll start at the very bottom and work are way to the top. Wow, what a list! Who would have guessed that my top three states that I'd consider residing in would be Delaware, Nevada or Ohio? Each state affords its residents both wonderful natural beauty and a friendly climate. Ironically, all three are also key geographic hub locations. Ohio is an excellent starting point for traveling all over the Mid-West. Delaware is perfect for getting up and down the East Coast. Nevada is centered squarely in the West. If you like to travel (and I do), then each of these three states is a prime candidate. As we go down the list of results, we can see that there's lots of other states I'd consider living in, but only in certain metropolitan areas. Arkansas would be a perfectly acceptable state for residence if living near a major city, as would Missouri. Farther down the list, there are states where it would take some serious convincing for me to live there, like Vermont (beautiful and friendly, but terrible winters) and Utah (gorgeous landscape, but too many religious fundamentalists). Then we have the dredges of the states, places like Alabama, California, Minnesota and Mississippi. I'd have to be under duress to consider living in these states. They are not appealing to me at all. Finally, in last place, all by its lonesome... we have Florida. What a terrible, terrible place to ever live. Never in a million years would I even dream of owning a home in the Sunshine State. Thanks for following along on this journey, my friends. I'd be curious to see your own results. Complete the two maps, tally up your points and share the results. Until next time!